At the turn of the last century police were carefully watching the five-story building at No. 105 Second Avenue. John Mikolaus had operated his restaurant, The Crystal Palace Café, from the ground floor since around 1895, renting the modest apartments upstairs. But rumors of an illegal “gambling house” in the building keep detectives on alert. Despite the questionable goings-on, Mikolaus was a fair employer and when waiters across the city went on strike in 1915, his staff stood by him. On December 14 a mob of several hundred strikers gathered outside the restaurant. They pushed their way into the establishment, telling diners not to eat there and intimidating the waiters to join them. Neither happened. The mob “slunk away” with the arrival of police back-up; but eight were arrested on charges of grand larceny. There were, strangely enough, no arrests for assault or destruction of property. The restaurant sat squarely in what was by now the epicenter of Jewish life. New York City had the largest Jewish population of any city in the world. Second Avenue around Mikolaus’ building became known as The Jewish Rialto--named for the string of Yiddish-language theaters that opened between Houston Street and 14th Streets. By the early 1920s an entire star system had developed among the Yiddish actors. After three decades of doing business here, John Mikolaus sold his building in October 1924. The New York Times reported that the buyer would “improve the property.” “Improving property” in the early decades of the last century translated into demolishing and replacing whatever stood on the site. And, indeed, the M. & S. Circuit Company did just that. The new owners commissioned architect Harrison G. Wiseman to design a five-story vaudeville theater-and-office building. Completed within the year, it was a rather bland red brick structure trimmed in stone with tepid Moorish influence. Any focus to ornamentation was reserved for the interiors. Here Art Deco joined with classic, dramatic theater architecture—vaulted arches, gilded and polychrome pilasters and medallions, and chandeliers. One year later the Great Depression hit and began a dismal period of unemployment. Among the hardest hit were the already impoverished residents of the Lower East Side. On November 26, 1931 the Commodore was the scene of a moving rally. In 1956 New York City police were confounded by a “Mad Bomber,” who kept the bomb squad rushing from one crowded building to another. The bomber called in the locations of his devices—most just harmless facsimiles; others far too real. A live pipe bomb was found in a telephone booth in the main New York Public Library and another in the Paramount Theatre on Broadway and 43rd Street. They were detonated by the squad. On December 18, 1956 alone, telephoned threats were directed at “a church, a hospital, the new Coliseum, the new forty-five story Socony-Mobil Building, Grand Central Terminal, the Port Authority Bus Terminal, Carnegie Hall Studios, a department store in Brooklyn, hotels, subway stations, and trains, bank buildings, newspaper offices, neighborhood movie theatres, and just plain buildings.” The Commodore was not immune. “Another dud that sent the police racing to the scene was found at the Commodore Theatre on Second Avenue near Sixth Street,” said The Times. 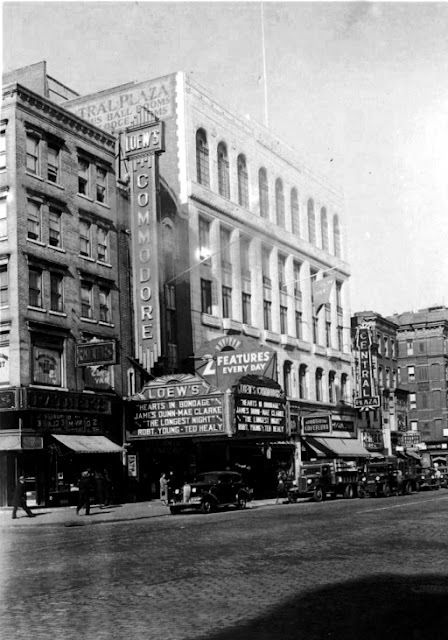 In October 1963 the Commodore became the Village Theatre when a syndicate run by Joseph R. Burstin, Milt Warner and Bernard Waltzer purchased the building. The new owners told reporters it would be renovated into an off-Broadway live theater, stressing it “would not be burlesque,” according to The Times. The renovated space opened in November 1964 and, despite the promise, offered burlesque. Theater would give way to concerts when in 1967 WOR-FM radio station staged a live music event here to celebrate its first anniversary. The audience heard performances by Janis Ian, The Doors, Richie Havens, The Blue Project and other popular groups. It was the beginning of a new period for the venue and musical history in America. Bill Graham Presents purchased the building shortly afterwards. On March 8, 1968 it reopened as the Fillmore East, the New York bookend to Graham’s San Francisco Fillmore West. It quickly became the mecca of East Coast popular music lovers, staging several concerts a week. The first year alone Big Brother & the Holding Company, The Doors; Richie Havens, The Who, Mothers of Invention, the James Cotton Band, Iron Butterfly, Jefferson Airplane, Jimi Hendrix, Sly and the Family Stone, the Byrds, Ravi Shankar, Moby Grape. The Grateful Dead, Steppenwolf, Joan Baez, Blood Sweat and Tears, the Beach Boys, Creedence Clearwater Revival, the Moody Blues, and Fleetwood Mac played here. Then, citing “changes in music” and saying “this is an industry we can no longer work in with integrity,” Graham closed down the Fillmore East on June 27, 1971. The iconic venue which George Gent of The New York Times called “the best showplace for rock music in New York” sat dark for over three years; until Barry Stuart reopened it as the NFE Theatre with a concert by Bachman-Turner Overdrive. The acronym stood for New Fillmore East and, reportedly, Bill Graham objected to the name, resulting in its being changed to Village East. Stuart’s concert venue would survive for only four years. After its 1975 closing, the building again sat dark until 1980 when entrepreneur Bruce Mailman and his partner, architectural designer Charles Terrell converted it to the country’s ultimate gay club—The Saint. The $4.5 million renovation set the standard for disco-period nightclubs nationwide. Thousands crowded onto a 5,000 square-foot circular dance floor below a domed planetarium ceiling. The rotating, dual Spitz Space System hemisphere star projector was ten times more powerful than those used in planetariums. Celebrity performers like Helen Reddy, Chita Rivera, the Weather Girls, Maureen McGovern and Melba Moore entertained the audiences. Today the ground floor space is a disappointing denouement to a remarkable story. Where Yiddish theater was followed by motion pictures, where burlesque was followed by Off-Broadway plays, where Janis Joplin entertained thousands before gay men danced below a gigantic planetarium is now a bland bank office. The generations who remember No. 105 Second Avenue as the Village Theatre, the Fillmore East, or the Saint are fading and the history that played out inside the unremarkable building is mostly forgotten. The 1887 Catholic Apostolic Church -- No. 417 W 57th St. In the late 1820s the Reverend Edward Irving was pastor of the Scottish Church on Regent Square in London. But Edward Irving had an epiphany and broke away from the church, founding the Catholic Apostolic Church. Irving was “deposed” from the church and “the members are sometimes called Irvingites on this account,” explained The New York Times more than half a century later. In 1887, Frank Leslie’s Sunday Magazine would call it “one of the oddest denominations in the world.” The strongest belief of the new sect was that the Second Coming was right around the corner—precisely it would come about in 1835. Twelve “apostles” were chosen and only they had the power to ordain priests and bishops, called “angels”. When 1835 came and went without the Second Coming, the church simply revised its calculations and moved on; eventually branching out to New York City in 1848. 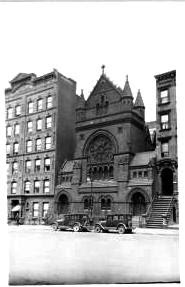 The small brick church in Greenwich Village that the new congregation took over was sufficient until 1885 when the growing membership necessitated a larger structure. 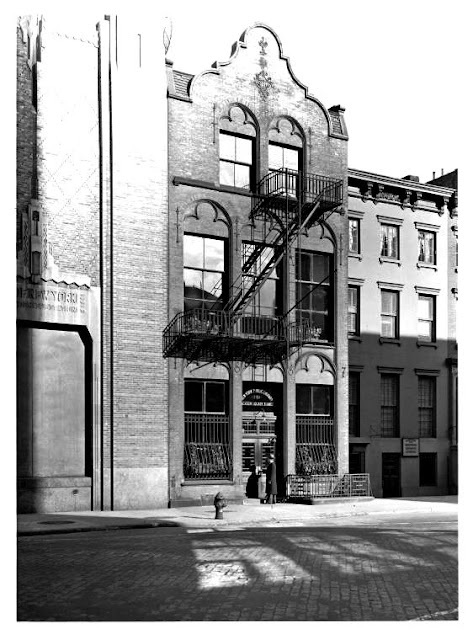 In 1885 the Catholic Apostolic Church sold its West 16th Street building to the Eglise Evangelique Francaise and laid plans for a new building further uptown. Francis Hatch Kimball was given the commission to design a new church building at No. 417 West 57th Street. Actual construction began in 1886 and was completed a year later. The architect created a singular design that refused to be categorized in any pre-existing architectural category. Kimball mixed materials—orange brick, terra cotta, brownstone, and tile—and styles—Gothic Revival and Renaissance Revival with a splash of Queen Anne. The result was a hefty presence of arches and spires, textures and angles. The Sun said there was “a touch of Byzantine style in its façade.” Like its congregation, the church building was quite unlike any other in the city. Two weeks earlier, Rev. Davenport had predicted the end of the world in his sermon “The Terrible Calamities which Threaten Europe and America.” Using the fourth chapter of Matthew in which Christ lays out the steps to the world’s end, Davenport pointed out that they had all come to pass. As in 1835, neither the end of the world nor the Second Coming came to pass. The article described the service. “It is impressive, not so ceremonious as in some of the ritualistic Episcopal churches, but requiring more assistants. The vestments are very rich. At one side of the chancel is the throne, which is the seat of the angel. Angel is the old word, as used in the book of Revelation for the Bishop of a church, and throughout the Bible in the correct sense, of messenger, spiritual or otherwise. The church was correct in anticipating Woodhouse’s passing—he died within the year—however once again neither the end of the world nor the Second Coming came to pass. There was no longer anyone with the power to ordain priests or perform the duties of the head of the church. Woodhouse’s death ushered in “the time of silence” during which congregants would wait for divine direction. In 1942 attention was focused on a more earthly issue. In the sweltering summer heat, city residents often sought relief by sleeping on fire escapes and rooftops. On July 18 two girls—Ann Smith and Myrtle Rosengrants, aged 11 and 16 years old—went to the roof of their apartment building next door at No. 415 West 57th Street. “Frightened by the appearance on the roof of a strange man, the girls…backed up to the edge of the building, stumbled over the one-foot safety wall and fell twenty-five feet from the roof of their home…to the church roof,” reported The Times. The two terrified girls clung to the tiled roof of the Catholic Apostolic Church while neighbors called police. Emergency squad detectives Thomas Childs and Joseph Demas donned safety belts on the apartment building roof. “Demas lowered himself by Childs’s arms and dropped to the church roof. The younger girl, Ann, fainted as he reached her,” said the newspaper. After the girls were hoisted to the roof of their building, they were taken to Roosevelt Hospital. They both had broken left arms. The time of silence lasted throughout the 20th century. By 1995 the decimated congregation realized it could no longer sustain the venerable edifice. Fearful that the church building would be converted to a club or retail space, it offered it to the Lutheran Life’s Journey Ministries. The Lutheran Church initiated a restoration of the 110-year old church, cleaning the façade and replacing any missing terra cotta elements. Architect Andrew Levenbaum spearheaded the renovation of the interior space. A bizarre discovery was made in the basement when the original terra cotta cross from the roof was found buried below three feet of soil. Restored, Kimball’s wonderful building was rededicated in 1997 as the Church for All Nations—a surprising gem on an otherwise mundane block. In 1827 Henry Street on Manhattan’s Lower East Side was undergoing rapid development. Brick-clad Federal-style homes were erected for the city’s well-to-do merchant class. No. 265 was completed that year, one of a row of elegant residences boasting costly touches. At No. 265 these included Flemish-bond brickwork above a brownstone basement, an elaborate door frame with fluted Ionic colunnettes and intricate iron cage newels. In the years just prior to the Civil War Alderman Thomas W. Adams lived in the house. He was seriously ill at the start of his last term, which ended with his retirement on December 31, 1859. At 2:00 on the afternoon of January 3, 1860 a group of citizens assembled at the Henry Street house. The New York Times reported that “Mr. Wm. L. Ely, on their behalf, presented to Mr. Adams an elegant gold watch, with hunting-case, gold chains, pencil-case and key, all costing $363.” The gifts represented a substantial testimonial worth about $7,000 today. Charles W. Moores was next to move into No. 265 Henry Street. When Union soldier Charles T. Jenkins of Company D of the 40th Regiment Ohio Volunteers died in New York on Thursday, April 3, 1863, the Moores family offered the house for his funeral. Only four months later, on August 27, Charles’ son William was drafted into the conflict. By 1893 the Henry Street neighborhood was no longer the stylish enclave it had been during the Civil War. Wealthy residents had moved away and tenement houses crowded with impoverished immigrants had replaced many of the homes. 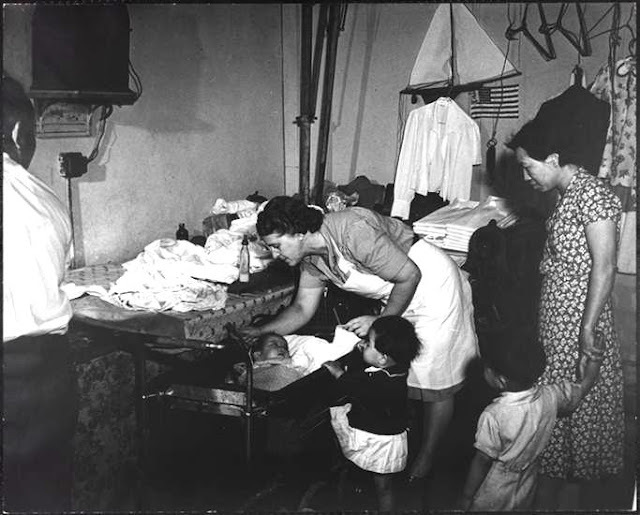 That year Lillian Wald, a young graduate nurse from the New York Training School for Nurses, began teaching a class in home nursing and hygiene to immigrant women in the neighborhood. With her friend, Mary Brewster, Lillian Wald established the Visiting Nurses Service using donated funds. By January 1894 the pair had visited more than 125 families. In the spring of 1895 German-Jewish banker Jacob Schiff purchased the house at No. 265 Henry Street to be used by fledgling organization. The house was enlarged with a full third floor, its windows being carefully matched and a modest but architecturally-appropriate cornice installed. Soon there were eleven residents in the house, including nurse Lavinia Dock, an ardent suffragist, feminist and union organizer. A diverse group, the women lived and worked together, arising for the 7:30 breakfast followed by a meeting to discuss the day’s schedule and to address any problems or difficult situations. The nurses went into the field, returning for lunch most often, and teaching in the afternoons. A cooking class, the Good Times Club, cost five cents per week and was a favorite in the neighborhood. Immigrants could learn English here and study rooms were provided. The residents of the area showed their gratitude however they could. The women of the Nurses’ Settlement were accustomed to speaking out against injustice and civil wrong. When police allegedly over-reacted when the funeral of Rabbi Joseph erupted into a full-scale riot in the summer of 1902, one of the residents spoke out. “Jane W. Hitchcock of 265 Henry Street, who is connected with the Mercy Settlement, declared that policemen had handled women with unnecessary force,” reported The Times on August 20. Lillian Wald wrote of the myriad illnesses the nurses dealt with in the first years of the 20th century. There were nursing infants, many of them with the summer bowel complaint that sent infant mortality soaring during the hot months; there were children with measles, not quarantined; there were children with opthalmia, a contagious eye disease; there were children scarred with vermin bites; there were adults with typhoid; there was a case of puerperal septicemia, lying on a vermin-infested bed without sheets or pillow cases; a family consisting of a pregnant mother, a crippled child and two others living on dry bread; a young girl dying of tuberculosis amid the very conditions that had produced the disease. In 1903 Schiff donated the house to the Settlement. Three years later the house next door, at No. 267, was donated by another German-Jewish philanthropist, Morris Loeb. By now the settlement had expanded its services to offer a summer camp. Camp Henry was located upstate near Peekskill and every summer around 45 boys, “all from the Ghetto,” as described by The Sun, enjoyed fresh air and escape from the city. From its modest beginnings in the old house on Henry Street, Lillian Wald’s settlement had burgeoned by now. A kindergarten had been established at No. 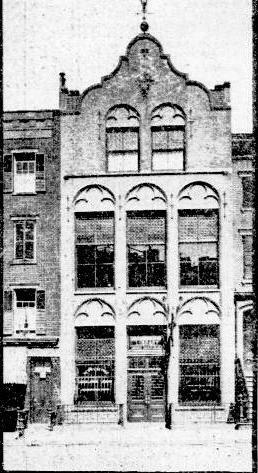 279 East Broadway (later moved to a house on Montgomery Street), additional residential space for two nurses was acquired on one floor at No. 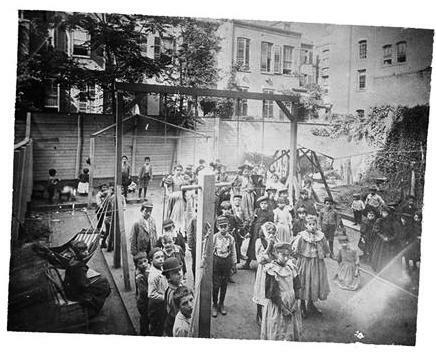 52 Henry Street, dancing and gymnasium classes were conducted in the Children’s Aid Society building, and domestic science and home nursing classes were held at No. 226 Henry Street. In 1905 the number of nurses had risen to twenty-four. When Lillian Wald retired in 1933 after four decades of service, her nursing staff had risen to 265. They still climbed tenement stairs and rode subways to reach sick patients. That year they would make 550,000 home visits. Wald died in 1940 following a long illness and four years later the Settlement was reorganized. The Visiting Nurses Service moved uptown while the Henry Street Settlement remained to focus on the needs of the immediate population. The Settlement’s administrative offices remain in the three old Federal-style homes at Nos. 263 through 267 Henry Street. In 1966 the houses were designated New York City landmarks and in 1992 No. 265 was restored. Amazingly, throughout its century of use by the Settlement, the exquisite doorway and the original ironwork of the stoop survive. The handsome home endures not only as an rare architectural landmark, but as an important part in New York’s social history. As the Civil War drew to a close, the Murray Hill neighborhood attracted wealthy merchant class residents who moved into wide brownstone rowhouses. The south side of East 38th Street, between Madison and Park Avenues was lined with four-story Italianate homes including No. 38, the home of Henry Randel and his wife, the former Caroline Malvina Perrine. Earlier, in 1840, Randel had partnered with James Baremore to form the high-end jewelry company Randel & Baremore. The pair opened their first store at No. 32 North Moore Street. In 1851 they hired Chester Billings as a clerk. Fifteen years later Billings became a partner and the firm was renamed Randel, Baremore &amp Billings; Co. It was a risky move. Americans were largely disinterested in cut gemstones; however Randel, Baremore & Billings now held a near-monopoly in the diamond trade in New York. The partners amassed personal fortunes. James Baremore traveled to France in 1867. New York was shocked to receive the news that the 48-year old died in Paris on Friday, September 27. The body had to be transported home on a steamer, and almost a month later, on Friday October 18 at 2:00 in the afternoon, Baremore’s funeral was held in the parlor of the Randel home at 38 East 38th Street. The home would be the scene of another unexpected funeral on Wednesday, January 28, 1874. Caroline’s brother, Isaac C. Perrine, died near Omaha on January 23. His body was brought back to New York for the 38th Street funeral. The Randel family received a scare on March 30, 1885. While traveling in Washington DC the 68-year old Henry Randel “was suddenly prostrated at dinner,” as reported in The Sun. The resilient jeweler recovered however and it would be another twelve years before he finally retired. On February 23, 1897 Henry Randel and Chester Billings issued a Notice of Dissolution. The partnership was dissolved “by mutual consent” and continued business under the name of Chester Billings & Son. Ironically, it was Billings who died later that same year. The Randel’s daughter, Emelie, was no longer in the house by now. Divorced, she married the staggeringly-wealthy director of the Standard Oil Company, Henry Huttleston Rogers, in 1896. Her aging parents kept up their annual pilgrimages to various summer resorts, along with the rest of New York’s wealthy citizens. For the summer season of 1900 they took “the Hathorn Cottage” in Saratoga and the following year leased the William Kent Cottage in Tuxedo, New York. The Times was a bit tardy in its reporting. Henry Randel had been dead for two days when the article came out. The body of the 84-year old was brought back to the house on 38th Street, where his funeral was held on Monday, July 29 at 10:30 a.m. Within the year Caroline Randel left the house she and her husband had shared for over half a century. She moved to No. 667 Madison Avenue and the 38th Street house was offered for sale. It was undoubtedly no coincidence that the buyer of the family home was Emelie Rogers’ step-son, H. H. Rogers, Jr.
Rogers lost no time in updating the architecturally out-of-fashion home. Like other wealthy homeowners in the still-upscale neighborhood, he gave the old house a facelift. Rogers commissioned architect Charles Brigham to design an entirely new façade. What resulted was an imposing limestone mansion overflowing with classical details—scrolled broken pediments embracing carved urns over the parlor windows, two-story fluted pilasters at the upper floors, menacing carved lions heads in the brackets of the limestone balcony and elaborate oversized volutes that rolled away from the free-standing Corinthian entrance columns. Unusual for the East Side of Manhattan, Brigham used a dog-leg stoop. But unlike its West Side counterparts, he treated it imperiously. Squared columns with Ionic pilasters supported four classical urns. Ornate ironwork provided a screen and regal iron gates protected the service entrance. 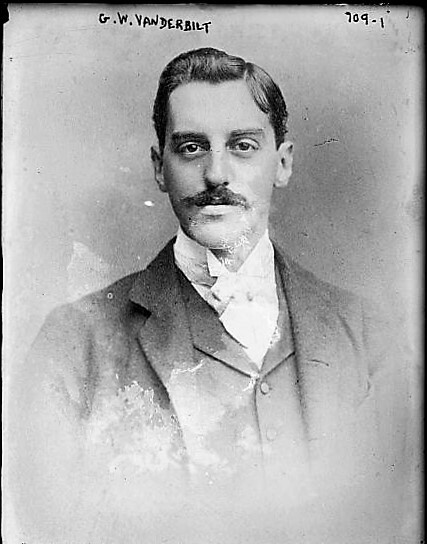 The 26-year old was already a member of the firm Baring & Co. at No. 15 Wall Street and before long would hold memberships in New York’s most exclusive clubs—The Union, Racquet and Riding, and Tuxedo Clubs among them. He was quickly established as one of society’s most eligible bachelors. Following the Barings, the family of Winthrop Burr took the house. 1907 was an important year for the Burrs as daughter Rosamond was being introduced to society. On December 5 Mrs. Burr hosted an afternoon tea for Rosamond, followed by a dinner “of fourteen covers.” Helping Rosamond and her mother receive were six other young socialites. The following evening twenty-eight guests dined in the Burr mansion. Afterward Mrs. Burr gave a dance in the Assembly Room of the Colony Club. The impressive guest list included the top names in New York society: Fish, Roosevelt, Harriman, Gould, Morgan, Sloane, Townsend among them. Guests expected favors and Mrs. Burr’s seem somewhat surprising to modern minds. “There were four sets of favors, including fancy lace bags and jardinières of ferns, assorted baskets trimmed with roses, toy monkeys holding ferns, carved Japanese daggers, hand mirrors tied with ribbons, velvet cat pin cushions and shaving pads,” noted The Times. After the cotillion supper was served for the 210 guests. Through the 1920s well-to-do tenants included Mrs. F. Stanhope Philips, who also lived in Santa Barbara, California; Dr. John P. A. Lang, and Dr. Samuel Gottesman. Dr. Gottesman was living here in 1925 when he married Lillie Simmonds and the couple was still here in 1929 when they announced the arrival of their baby daughter on January 28. In 1936 the house was structurally converted to apartments—just two per floor with a doctor’s office in the basement level. Among the tenants was Leonard M. Holland who had been wine steward at the Waldorf-Astoria for 12 years when he died in his sleep in his apartment in 1945. In 2006 the house was renovated once again. The doctor’s office remains in the basement level; but now the house is divided into a triplex stretching from the parlor through the third floor, and three apartments above. Today the exterior of the imposing house is little changed from the 1902 renovation. Vanderbilt kept his list current and when he died on March 6, 1914 at the age of 51 following an appendectomy, his last entry was No. 3159—Volume III of Henry Adams’ “History of the United States.” George Vanderbilt was reading an average of 81 books a year at the time of his death. Few New Yorkers had the money or leisure time that enabled George Vanderbilt to pursue reading. 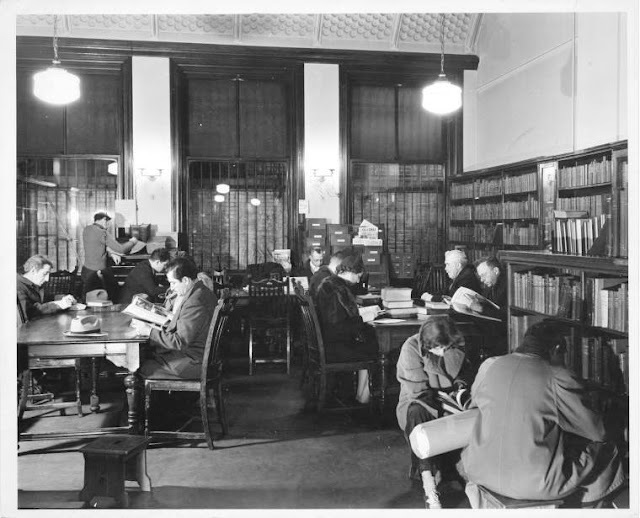 The few libraries that existed prior to 1880 were not open to the general public. But that year the Free Circulating Library was incorporated. The response was so great that the sidewalks around the first library—a single room in a building on 13th Street near Fourth Avenue—were blocked. At closing time on one occasion, of the 500 books only two were left on the shelves. George W. Vanderbilt - from the collection of the Library of Congress. 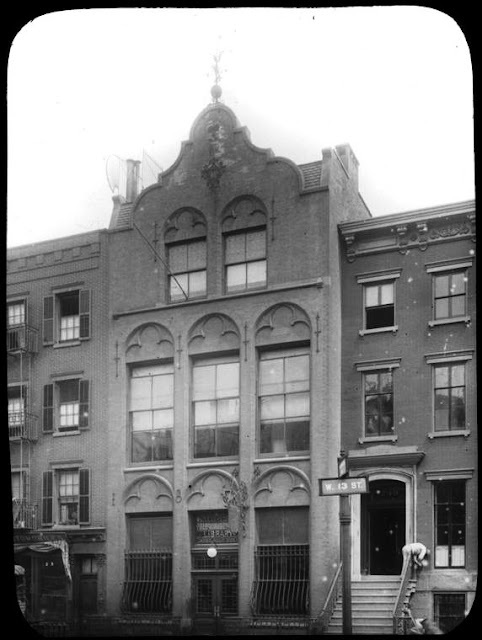 It was the sort of worthy project that caught the attention of the bibliophile Vanderbilt and he decided to fund a branch of the Lending Library in Greenwich Village, opposite Jackson Square. In 1887 Vanderbilt was no stranger to Richard Morris Hunt. Work was underway that year on George’s stable on Staten Island and on the Vanderbilt Family Mausoleum, both designed by Hunt. Ten years earlier the esteemed architect had designed the massive William K. Vanderbilt chateau on Fifth Avenue and within a year he would begin work on the palatial Marble House in Newport, also for William. The handsome new building was, nevertheless, an “ornament” to the neighborhood. Unlike the frothy confections that characterized some of the other Vanderbilt projects; the library was a take on a Flemish guildhall. It was a very early example of the architectural fad that would sweep the city in the next decade recalling Manhattan’s Dutch roots. A red-tiled roof hid behind a curving Flemish Renaissance gable and wrought iron strapwork decorated the red brick façade. Wrought iron numerals on the four piers, just above the first floor, gave the date of construction: 1887. A touch of Gothic was introduced by the trefoil decorations in the blind arches of the window openings. Wrought iron numbers spell out the date of construction. Until that year, readers looked over the library’s catalog of books, noted the number of the volume he wanted, filled out a call slip and waited until the librarian returned “after a weary search to inform him that the book is out,” said The Sun. Under Wing’s system, the reader simply wandered the shelves, chose his book and checked it out. The Sun was impressed. 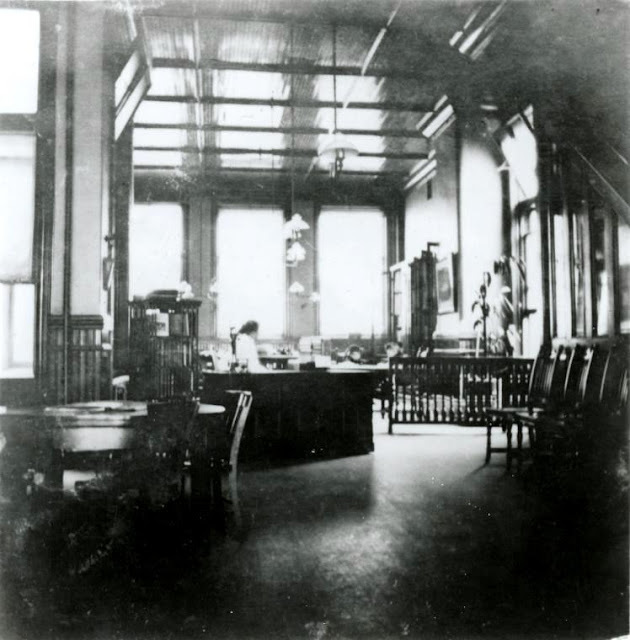 “From 1880, when the first branch was opened, up to about eighteen months ago the public was excluded from the places where the books were kept, and when the proposition was made to give the readers free access to all books in the library many of the attendants shook their heads.” The experiment was tried with one branch, then two, and by August 1899 all the libraries were on board. Instead he suggested placing the contaminated book under a bell jar with a saucer of formaline. Although apparently effective it was a labor- and time-consuming process. Nevertheless, nearly a decade later the fears of Dr. Billings would manifest themselves at the Jackson Square Library. The janitor and his family lived in the building and in January 1908 his son fell ill with scarlet fever. The innovative programs, like the current events boards, continued throughout first half of the 20th century. Art displays were a regular event. In 1951 there were an exhibition of drawings of pre-war Korea by a young Korean student and artist, Sam-Kih Min; and another of artwork by Turkish school children. In the 1950s “story-hour” entranced children as story books were read aloud. The library building gained a replacement weather vane in the renovations. Fontana, who told The Times “the place was ridiculous,” commissioned architect Ron Bentley to redesign the interiors. In the annihilation of the Rudolph design, Bentley fashioned an upscale single family residence on the two upper floors. Fontana’s offices were installed in the lower two stories where Rudolph’s single surviving feature, the entrance, remains.